By law, bills for water and sewer service must be delivered directly to the property owner, as listed on the deed. 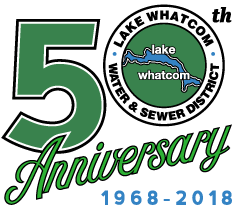 As a courtesy, Lake Whatcom Water and Sewer District can deliver a copy of the bill to the service address, as well as to any property manager, in addition to the original bill sent to the owner. The copy of the bill sent to the service address will be addressed to “Current Resident.” We do not add tenant’s names to the water and sewer service account. Whether a property owner lives at the service address or rents it out, ultimate liability for the water bill falls to the property owner. Duplicate/current resident billing does not relieve the property owner or the property itself of liability for any and all water and sewer charges. It is up to the owner and tenant to agree on billing arrangements for initial or final bills in which the tenant moves in or out in the middle of a billing cycle. Unfortunately, at this time, renters are not eligible to set up auto-pay with Lake Whatcom Water & Sewer.